many of these elements have high atomic numbers and more than two stable isotopes. These features make the different elements susceptible to different fractionation mechanisms, and by extension, make them unique tracers of different cosmochemical, geological and biological processes, as highlighted throughout this volume. Large variations have been documented in both natural samples and laboratory experiments for non-traditional stable isotopes. 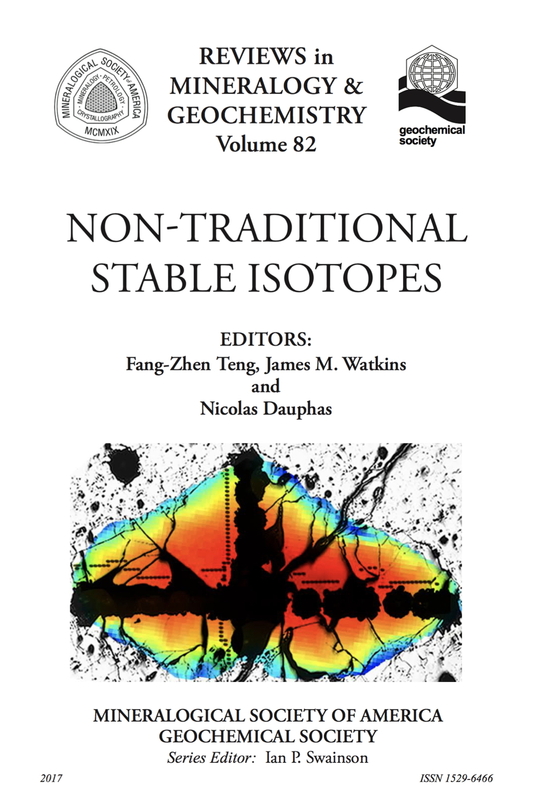 These studies suggest that the following factors control the degree of isotope fractionation in non-traditional stable isotopes during various processes: the relative mass difference between isotopes, change of the oxidation state, biological sensitivity, and volatility. Among these elements, Li displays the largest isotopic variation in terrestrial samples, and since Li is not volatile during geological processes and is not sensitive to redox reactions and biological processes, the large isotope fractionation is controlled mainly by the large relative mass difference. For many of the other elements, other factors may be equally, if not more, important. For example, Chlorine exhibits the second largest isotopic variation, which is due to kinetic isotope fractionation during volcanic degassing. Selenium isotopes also show large isotopic variations, but this reflects redox-controlled Se isotope fractionation, while the large mercury isotopic variations are mainly associated with biological processes. 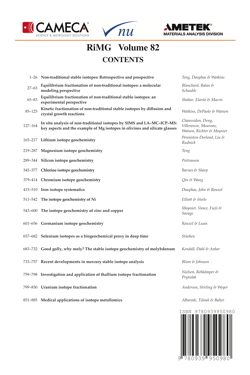 by Fang-Zhen Teng, Nicolas Dauphas, James M. Watkins, p. 1-26.
by Marc Blanchard, Etienne Balan, Edwin A. Schauble, p. 27-64.
by Anat Shahar, Stephen M. Elardo, Catherine A. Macris, p. 65-84.
by James M. Watkins, Donald J. DePaolo, E. Bruce Watson, p. 85-126.
by Marc Chaussidon, Zhengbin Deng, Johan Villeneuve, Julien Moureau, Bruce Watson, Frank Richter, Frédéric Moynier, p. 127-164.
by Sarah Penniston-Dorland, Xiao-Ming Liu, Roberta L. Rudnick, p. 165-218.
by Fang-Zhen Teng, p. 219-288.
by Franck Poitrasson, p. 28-344.
by Jaime D. Barnes, Zachary D. Sharp, p. 345-378.
by Liping Qin, Xiangli Wang, p. 379-414.
by Tim Elliott, Robert C. J. Steele, p. 511-542.
by Frédéric Moynier, Derek Vance, Toshiyuki Fujii, Paul Savage, p. 543-600.
by Eva E. Stüeken, p. 657-682.
by Brian Kendall, Tais W. Dahl, Ariel D. Anbar, p. 683-732.
by Joel D. Blum, Marcus W. Johnson, p. 733-758.
by Sune G. Nielsen, Mark Rehkämper, Julie Prytulak, p. 759-798.
by Morten B. Andersen, Claudine H. Stirling, Stefan Weyer, p. 799-850.
by Tim Elliott, Robert C. J. Steele, p. 851-885.